There is no doubt that India’s bowling attack was severely hampered the moment Zaheer Khan tweaked his hamstring at Lords in the first Test. They have caused England’s batsmen spasmodic problems but then failed in ramming home any sort of advantage that their attack could muster. At Lords in the second innings England were wobbling with India doing their utmost to wrestle the momentum from the hosts, and at 107-6 (a lead for England of 295 at this point) the game may not quite have been considered ‘in the balance’ but India were giving themselves a hint of an opportunity. Yet they couldn’t break the Matt Prior and Stuart Broad partnership and the game was soon beyond them. When MS Dhoni inserted England at Trent Bridge, they once again created a scramble for pads in the home dressing room, only for Broad again, this time in cahoots with Graeme Swann, to deny them a decisive confidence boosting innings in the series. They have sorely missed the wily Zaheer, with both the new ball and the old, and the hole he has left in the attack has been far too obvious than such a top side would have hoped. The fact that the other experienced bowler in the line-up, Harbhajan Singh, has also been way below par has not helped the situation. So when Chris Tremlett failed to reach full fitness for the second Test, were England about to miss his presence in a similar way ? Since Tremlett returned to the Test line-up at Perth in December of last year, he has picked up 36 wickets at 24.22, in the same timescale Jimmy Anderson has taken 35 wickets at 24.40 (including his five wickets at the Trent Bridge Test), and Graeme Swann has snared 20 victims, costing 38.45 apiece. Stuart Broad of course missed much of the Ashes series due to his side problem. The statistics demonstrate how integral a part of the side Tremlett has become of late, naturally to perform to such a high standard over some eight months is significantly different to maintaining that form for as long as Zaheer has, yet there’s no doubt with his ability to get awkward bounce from a good length, he would be missed. How much Tremlett was missed is testament to the man that replaced him, Tim Bresnan. Had it not been Bresnan, you would still fancy Steve Finn or Graham Onions or Ajmal Shahzad, to put in a similar effort with the ball, though unlikely they could match Bresnan’s excellence with the bat. The fierce competition ensures the current occupiers in the seam department remain committed and dedicated to reaching the highest possible standards. Broad was aware he needed to step up early in this series, and so far he has duly obliged, Anderson is continuing to torment one of the finest batsmen the world has seen, and Bresnan did all that can be expected of him at Nottingham. England have the kind of depth in the pace bowling that other nations would dearly love to have. Onions, now back to full fitness, would surely make any other Test playing nations’ starting XI, with Finn and Shahzad not too far behind. The potential coming through is also exciting, players such as James Harris, Jade Dernbach, Chris Woakes, etc, all have much to do before they are considered for a place in the Test line-up and will need to excel in domestic cricket and Lions matches to gain recognition, yet it all improves standards. But for now I’d like to dwell further on Bresnan’s impact. When he made his Test debut back in May 2009 against the West Indies, he was considered nothing more than a steady County cricketer, a medium paced bowler who would add depth to the batting. Since he impressed in Bangladesh with his control, pace, and ability to reverse swing the ball, his stock has continued to grow. His 11 wickets in two Tests in the Ashes showed his capabilities, but more than the stats, his skill in bowling to a plan, hitting the areas on a consistent basis and remaining patient were well rewarded and received nods of utter approval from previously harsh critics. 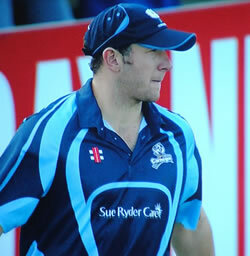 Bresnan’s short pitched bowling burst on Monday, targeting the left-handers mainly, Abhinav Mukund, Suresh Raina, and a real working over of Yuvraj Singh, showed his aggression and proved he can be as effective banging the ball in half way down in the right circumstances (and against the right players), as he can bowling a fuller length when there is swing on offer. Four of his five dismissals came with the short ball, and while he bowled plenty more, very few were wasted, not allowing the batter to simply sway out of harms way. If he used to be an under-rated bowler, people are now realising what he offers any side, he is indeed a much improved bowler. A current Test batting average of 37.85 and a bowling average of 25.09 means his record currently bears comparison to any great all-rounders of years gone by (though it would be unfair to expect such an exemplary record to remain). It is of course early days in his Test career and no doubt sterner tests lie ahead, although there are fewer challenges as tough as an Ashes series in Australia and facing an Indian side with so many quality batsmen. He is also yet to taste defeat, his eight Tests have yielded eight victories. Despite all this, there was the question of whether it would be enough to keep him in the side for Edgbaston ? It would have been a very tough call to leave the Yorkshireman out (which is unlikely to be the case now Tremlett has been ruled out of the fourth Test), but when England have so much quality competing for the bowling spots, there will always be difficult decisions to be made.